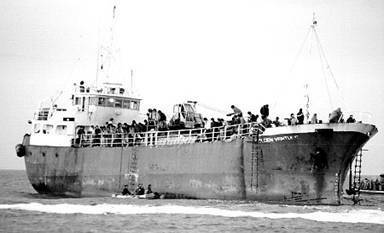 The Golden Venture, a ship bearing 286 undocumented immigrants from Fujian, China, ran aground at Rockaway Beach, Queens in 1993. Those that survived were taken into custody by U.S. Immigration and held in jails across America while applying for political asylum. Some remained in detention for years fighting their cases, the majority in Pennsylvania. The final 52 Chinese were released by President Bill Clinton in 1997. The Golden Venture washed up on our shores (copyright N.Y. Daily News). This drama led to not only the Tribeca Film Festival film Golden Venture, but also to the founding of a national nonprofit organization, Pro Bono Net, which had the then-revolutionary idea of using technology to help coordinate pro bono lawyers working for good. One decade later, this platform is more needed than ever. Today, as the economy continues to spiral downward and the number of the newly poor grows daily, the need for that long-cherished legal concept of pro bono assistance to those with growing legal problems has skyrocketed. With state budgets being slashed left and right, legal aid societies are hemorrhaging. With the rise in unemployment, families across the country are facing life-altering crises ranging from bankruptcies and evictions to domestic violence and divorce. Immigrant integration remains a large problem, and immigration courts have clogged to a near standstill. Lawyers who wish to help need both improved access to information on who needs help and better training and support to ensure quality representation. Law firms with pro bono projects need better management tools to bridge the gap between those with legal problems and their own attorneys who can help solve them. More than 300 nonprofit legal organizations and their volunteers are now connected through Pro Bono Net. With great foresight into emerging technologies, thought leader Mark O'Brien and co-founder Michael Hertz, who met while working on Golden Venture asylum cases at their law firms, saw a way ten years ago to prepare for this moment in time. Recognizing the potential for technology to transform access to justice, just as platforms such as match.com, monster.com, or even TurboTax were transforming other business processes, they launched Pro Bono Net. With even more insight, the Soros (Open Society Institute) Foundation funded it. Today Pro Bono Net's reach extends into states covering a staggering 70% of the U.S. poverty population and their websites have a membership of over 51,000 lawyers. Pro Bono Net is at the forefront of emerging technologies, and plans to stay on top. Public libraries are already gateways for the Internet-less to their platforms, and cell phones may be next. The programs of Pro Bono Net are as diverse as its clients: in addition to its main platform probono.net, which exists for the legal community, it has LawHelp.org where those in need can find referrals to local legal aid and pro bono programs, information about their rights and tools for self help. The Gates Foundation has funded a new offering which is a seamless extension of a law firm's intranet, helping the firm integrate content from the legal aid community regarding training events and volunteer opportunities with knowledge management and lawyer matching tools. The service, Pro Bono Manager, is cutting-edge: a for-profit business within a not-for-profit structure - with revenues invested back into the core mission. With support from The Carnegie Corporation Pro Bono Net spearheads the Immigration Advocates Network an online collaboration among leading immigrants rights organizations to provide training and technical assistance to a growing field. Fellow thought leader Stephen Chen and I recently sat down with Mark in his avant-garde Manhattan offices. "We must leverage the electronic resources at our disposal to create technologies that provide collaborative solutions to providing legal help for those in need," he emphasized. Recipients of legal aid, interestingly, are primarily women: about two-thirds. Ethnically, about half are white, a quarter black, and the remaining quarter Hispanic and other. Acknowledging this diverse audience, Pro Bono Net's consumer sites offer resources in 34 languages, including Spanish, Arabic, Chinese, Hindi, and Russian. According to the Chronicle of Philanthropy, "Navigating the legal system can be difficult if you don't have a lawyer." The most recent study, according to the Chronicle, shows that legal aid societies can only manage to assist 16% of those in need. That's 16% out of a poverty population in this country of almost 36 million. City, state, and federal governments recognize the value of what Pro Bono Net offers. Their courts are choked with people who cannot afford lawyers, representing themselves pro se. Courts would benefit greatly if those appearing before their benches had their documents in order, just as the IRS benefits from 1040's being filed correctly. Through an innovative online document assembly program, Pro Bono Net and its legal aid and court partners offer a growing array of user-friendly legal form - this century's equivalent of the old Bloomberg Forms from the stationers to assist self-helpers coping with issues such as debt collection, eviction, and child custody. Many attorneys in New York strive to contribute fifty hours of pro bono assistance each year, as suggested by the New York County Bar Association. In other counties and states, it is often forty hours that is recommended. The largest firms handle their fair share of pro bono cases, including: Kirkland & Ellis, Ballard Spahr Andrews & Ingersoll, LLP; Debevoise & Plimpton; Orrick, Herrington & Sutcliffe; Linklaters; Manatt, Phelps & Phillips; and Weil, Gotshal & Manges. Each of these firms is using the Gates-funded Pro Bono Manager. In solidarity with the many law firms that offer pro bono assistance for the benefit of America, I have convinced my own firm, Elite Imaging & Discovery, to offer our electronic discovery services at-cost to pro bono projects anywhere in the U.S.
Mark O'Brien first realized the need to connect lawyers electronically when the Golden Venture ran aground off Queens, scattering undocumented Chinese in need of legal representation throughout the East Coast. He knew he could leverage emerging technologies to make a difference in their lives - and the lives of millions of other Americans. Given the state of our economy, Americans themselves have been cast up on our shore and desperately need legal assistance as well. Pro Bono Net is there to help. The time is right to grow this innovation to scale. One of the consequences of the current economic crisis is that law firms across the country, which are getting hammered by the downturn in the economy, have resorted to paying stipends to law school graduates and associates to work for a year in public service. As this practice grows more and more widespread, vast numbers of recent graduates, as well as seasoned professionals, could be funneled from the corporate sector into the public sector. Law firms will save millions by doing so and stanch the hemorrhage to their balance sheets, while the public sector receives a massive influx of much needed attorneys. Perhaps an unintended result of our weakened economy is an emerging and important transformation of the legal terrain. With Stephen Chen and Eugene Lee. Edited by Ethel Grodzins Romm and Rebecca Nutley.